Note: The Cocoon mattress, a memory-foam over foam bed, comes from Sealy, a company with a history of more than a century making mattresses. The Cocoon model is the first product that Sealy has sold directly to consumers over the internet. If you’d prefer to watch rather than read, check out our full Cocoon mattress video review above. GoodBed's Take – Who is the Best Match for a Cocoon by Sealy Mattress? The Cocoon bed is Sealy's first entrant into the online mattress world. Instead of buying it in a mattress or department store, as you would other Sealy beds, the Cocoon is available exclusively online. It enters a world with a LOT of competition, so we were eager to see how it performs in our testing. 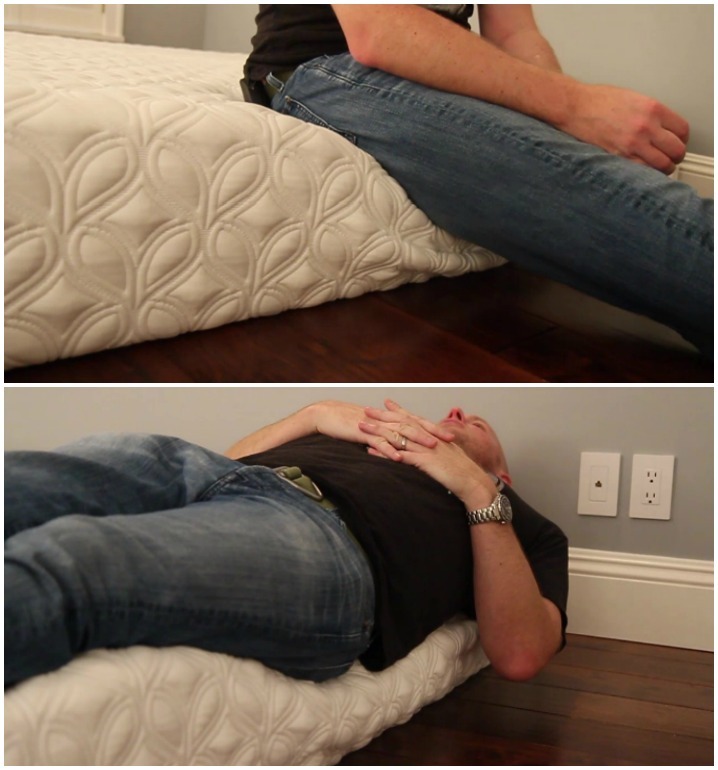 The Cocoon mattress is a 10" bed with relatively simple construction. Available in two softness levels, the Firm version features a 2" layer of memory foam atop an 8" layer of standard polyurethane foam. The similar Soft version features a 2" layer of the same memory foam, then 2" of a soft polyurethane foam, supported by a 6" block of polyurethane support foam. The two versions come wrapped in the same soft and stretchy cover. The company will even allow a one-time free exchange if you think you ordered the wrong version. An upgrade option is available for the cover; and extra $150 gets you the "Chill" cover, which includes some phase-change material intended to help regulate heat and keep you cooler. We'll speak more about that further below. 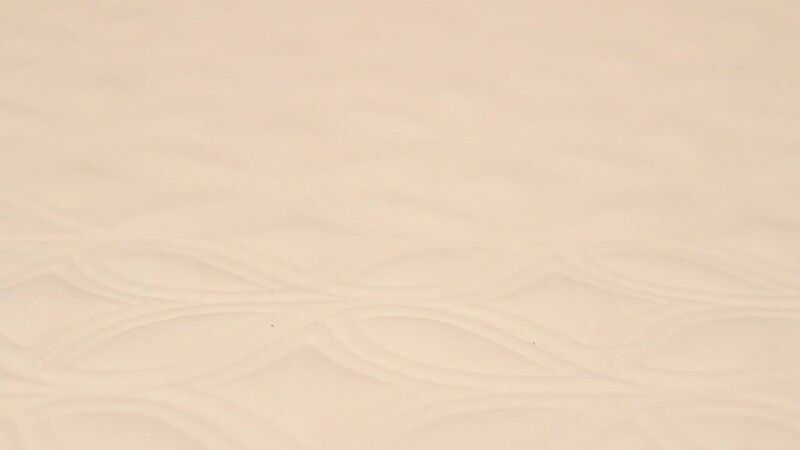 We found the memory foam featured in the Cocoon mattress to be particularly slow responding; when we pressed down into the bed with our hands, it took a full 10 seconds for the mattress to return to its shape. If you like that feeling of slowly melting into the bed, you might enjoy the Cocoon by Sealy mattress. We tested both of the versions of this mattress, called the "Firm" and the "Soft." Interestingly, however, we found the softness difference to be a lot more subtle than the names would suggest. On our scale, we would class the "Firm" version as a Medium Firm, while we found the "Soft" version to be about a Medium in our view. We noted more of a difference in cushioning depth, and we'll get to that in our detailed ratings below. We found back support, especially for back sleepers, to be very good in our tests, and we think both the Firm and the Soft versions are supportive and promote very good spinal alignment. If you are primarily a back sleeper considering the Cocoon by Sealy, the choice might come down to preference and whether you prefer more of a floating on top of your mattress feeling (Firm version) or prefer to sink in a bit more (Soft version). The two versions were more different for side and stomach sleeping. We felt side sleepers would be better served in terms of support and pressure relief by the Soft version, while those who sleep on their stomachs would be better supported by the Firm version. Motion isolation with both versions was a highlight in our tests, and we felt the Cocoon mattress would be a solid choice if you tend to be disturbed by a partner's movements in bed. It fell short, however, in our tests for edge support. Our tester felt himself slowly sliding off the bed when laying on the edge, so if you find yourself often pushed to the side of your mattress by kids or pets, that might be a concern for you. And because of the type of memory foam in the Cocoon bed, we felt it harder to move around and change sleeping positions, typically something that goes with the territory in mattresses with this kind of slow-responding foam. From a value standpoint, the Cocoon mattress sits right in the middle of the competition among all-foam beds, but if you like the idea of choosing a mattress from a company with a long history in the mattress industry, and one that's likely to be around for the lifetime of your bed, that could tip the scales assuming that its other performance and preference features suit your needs. You can use the Cocoon bed on any suitable and supportive foundation. Sealy sells a matching foundation, but it's not required. 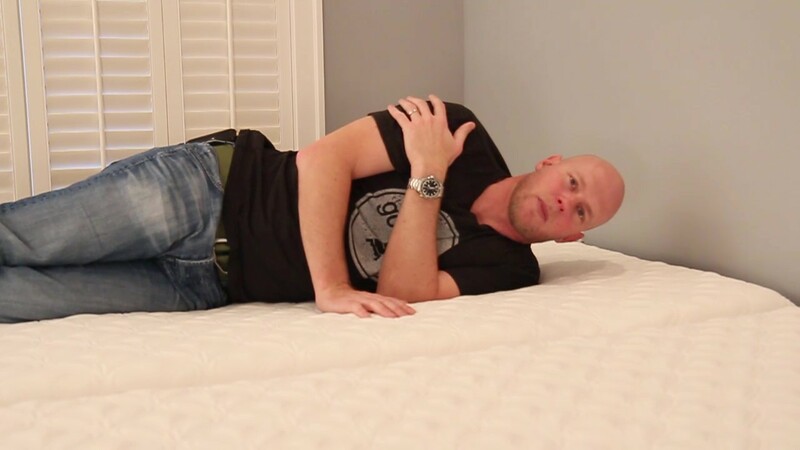 Read on for our detailed report and be sure to check out the video to see this mattress in action as we put it through our tests. You can always visit the company's website for more on the Cocoon by Sealy. Construction for the Cocoon bed is simple: memory foam on top and polyurethane foam on the bottom. Both versions of the mattress share the same 2" memory foam layer, and the same polyurethane form support foam. The difference for the Soft version is a 2" layer of softer polyurethane foam that as you'll see in our review provides somewhat deeper cushioning. Sealy has chosen not to disclose the densities of the foams used in the Cocoon bed. We typically use foam densities to estimate longevity and compare the bed to others. Our best guess, based on our experience, is that the memory foam is a 3-lb. density foam, a bit lower than we usually see on memory foam beds. The Support layer, we believe, is about a 2-lb. density, which is a little higher than we usually see (a 1.8-lb. density is fairly typical). 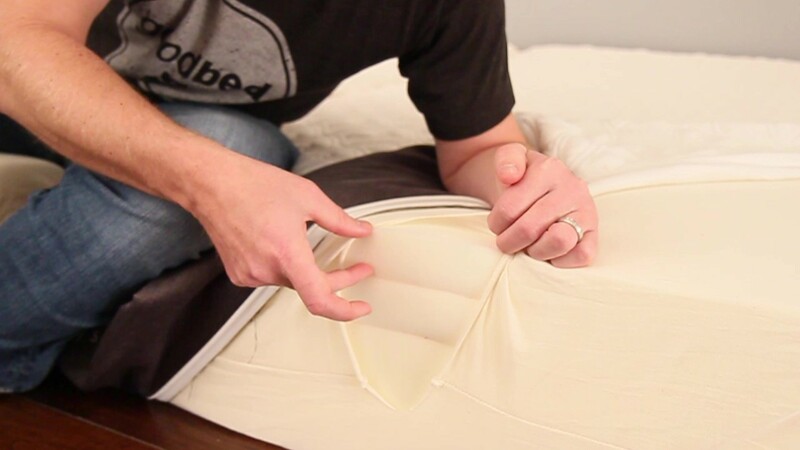 The layers of the Cocoon by Sealy mattress are wrapped in a stretchy and soft cover that seemed well made and sturdy. An optional upgrade is Cocoon's "Chill" cover, which the company says can help keep you cooler with the inclusion of phase-change fibers. That's a $150 option when you order the Cocoon bed. See the "temperature" section below on our views about the Chill cover. We evaluated both the Cocoon Firm and the Cocoon Soft, and found them to be more similar than the names would suggest. We found the "Firm" to be about a Medium Firm on our scale, while the "Soft" version came it at about a Medium. This refers to how deeply you sink into the mattress or feel cradled or hugged, versus a feeling of floating on top of the bed. We tried both versions of the Cocoon mattress and felt there was a bigger difference in cushioning depth than softness. with the firm version, we felt a lot more of the 'floating on top' feeling, and with the soft version, more of a medium level of cushioning. Both versions of the Cocoon mattress have the same 2" of memory foam on top, and it's a particularly slow-responding memory foam. When we pressed down on the bed, it took a full 10 seconds for the mattress to return to shape. Typically with all-foam beds, there isn't a lot of bounce, but the Cocoon mattress does have a bit (it's personal preference whether you like some bounce in your mattress or not). So the Cocoon by Sealy mattress is pretty interesting--a combination of very slow response but with some bounce as well. In our evaluations, the Cocoon mattress offered very good back support, but we did find it depended on your predominant sleeping position which version would be better. For most everyone, and on both versions, we felt that back sleepers would be well supported in particular. Our tester felt very supported in this position, on both the firm and soft versions of the Cocoon by Sealy mattress. His hips sank into the mattress, creating good spinal alignment, and his lumbar area felt supported. We felt that most people would feel similarly well supported in this position. When it came to side sleeping, our opinion differed based on the mattress version. with the firm Cocoon mattress, our tester didn't feel that his shoulders sank enough into the mattress, forcing a curve in his spine. But on the soft Cocoon mattress, he felt much better supported in the side-sleeping position. It was the opposite for stomach sleeping. On the firm version of the Cocoon bed, our tester felt his hips well supported, but on the soft version, they sank in too much, creating what we call a "hammocking" effect that can create too much arch in the back, and lead to discomfort or pain down the road. We felt that feeling on the soft version would be exacerbated for individuals heavier than our 200-lb. tester. We found pressure relief for the Cocoon bed to be very good for the Cocoon Soft. For the firm version, however, we felt all but the lightest individuals would not find enough pressure relief from those top 2" of memory foam. Overall, we felt the Soft version would be more appropriate for those who sleep predominantly on their sides. 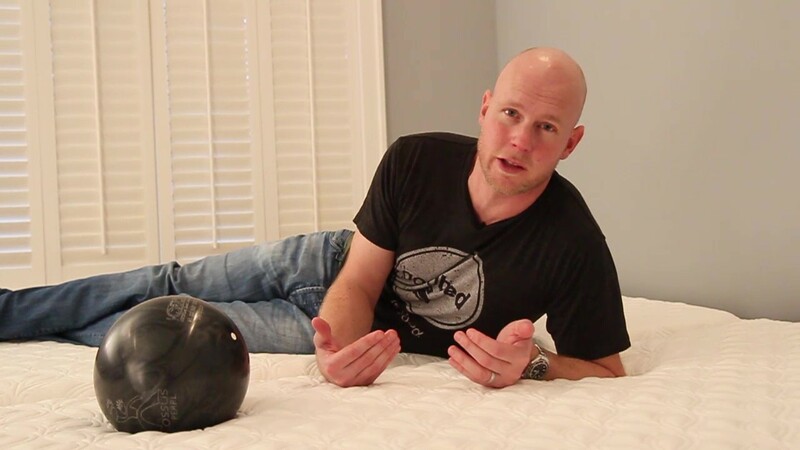 With a bowling pin standing upright on the Cocoon bed, we dropped a bowling ball on it to gauge how movements on one side of the mattress might be transferred to other areas. The pin barely moved. In general, foam and memory foam beds are good choices if you are easily disturbed by a partner's movements, and the Cocoon mattress is no exception. Memory foam has a reputation for heat retention, so this is always something we examine with foam beds. In the case of the Cocoon mattress, we think most people are unlikely to feel hot on the Firm version because you float more on top of the mattress. That means more of your body is exposed to the air. With the Soft version, you sink in more, so there's more chance of feeling hot, in our view. If overheating in bed is an issue for you, and you’ve experienced it with other mattresses, other models have features that are specifically intended to address this, and a foam bed likely is not your best choice. Sealy does have an upgraded cover meant to address this, the $150 optional "Chill" version of the mattress, with a cover that incorporates phase-change fibers. It's supposed to feel cool to the touch. When compared to the regular cover, we did think the Chill cover felt slightly cooler. When we put a sheet on top of both mattresses, however, we noticed very little difference. Overall, we are unsure that the Chill cover offers enough benefit to justify a $150 added expense. Foam mattresses aren’t typically very supportive along the very edge of the mattress—important if you like to sit on the edge of the bed, or if you tend to sleep along the edge. The Cocoon bed was no exception. When laying on the side of the bed, our tester felt himself sliding right off, and as the memory foam warmed under his body, the effect was even more pronounced. If you tend to really use the sides of your mattress, there are better choices. Ease of movement can also be an issue with memory foam especially the type of slow-responding memory foam used in the Cocoon mattress. Our tester felt it did take effort to move from position to position with the Cocoon mattress, but since there is only 2" of memory foam atop the bed, he did not find it overly cumbersome. 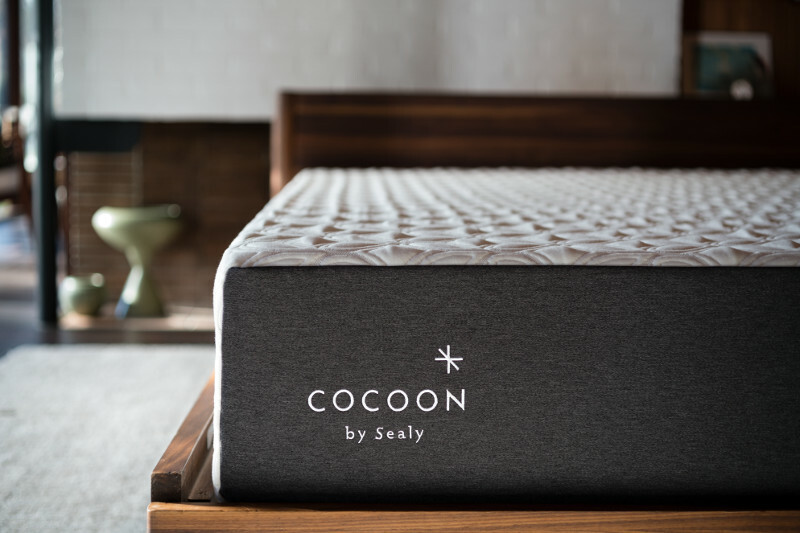 In the case of the Cocoon mattress by Sealy, the company makes no claims about the use of natural materials. However all of the foams used are certified to the CertiPUR-US standard, which verifies that a material has low VOC off-gassing as well as a lack of chemicals and other substances regulated by the CPSC. We did not specifically test the Cocoon mattress with an adjustable base. However, the company says that it may be used with one. The Cocoon by Sealy is a 10" memory foam over foam mattress made by a company with a long history in the mattress business. It competes against a number of similar foam mattresses in its price range, but the Cocoon does have a particularly slow-responding memory foam layer on top. So if you really want that slow, melting-into-the-bed feeling of memory foam, the Cocoon does have that characteristic. When it comes to estimating the comfort lifespan of a mattress, we tend to use foam density as our best, albeit imperfect, predictor of how long a foam will retain its shape and resiliency. In the case of the Cocoon mattress, Sealy has chosen not to disclose the densities used. Based on our experience, we can estimate the top memory foam to be about a 3-lb. density, which is a little low. If we had any concerns about compression, it would be that this top layer could soften prematurely compared to a denser foam. Sealy does warrant body impressions over 1" for a 10 years, however, so that should give some assurance. Pricing for the queen size Cocoon mattress is $799, a price that’s right in line, or even a little less, compared to other all-foam mattresses sold exclusively online. If its performance and preference features fit your needs, then we think it is a solid value. We have our doubts about the value of the optional "Chill" cover, however, given that we perceived little difference between it and the regular cover on the Cocoon bed. Cocoon includes free delivery via UPS, which is not particularly unusual among its competitors. The Cocoon bed comes in a big box; the queen size mattress weighs almost 65 pounds. Summary: Is the Cocoon Mattress Right for You? The Cocoon by Sealy mattress is an all-foam bed made by a company with a long and stable history in the industry. Here’s who we think the mattress is best for, based on our evaluation. Is the Cocoon mattress right for you? Take our Mattress Match Quiz to find mattresses that fit your needs, based on your preferences and price range. Looking for more on the Cocoon mattress from Sealy? Visit CocoonBySealy.com. Do Casper's "wave" channels really work to enhance support? Is "ultra luxury that's affordable" the right bed for you?